INTEC’s CVS500XL Multi Camera Controllers have been designed to meet the challenges of today’s installation requirements. With heavy duty injection cast aluminum alloy cases and stainless steel mounting plates, they can be placed without concern of harsh treatment. The CVS500XL can be mounted outside the vehicle, freeing up much needed interior space while decreasing installation time. You'll never need to run multiple camera cables into the cab again! The five camera inputs and multi-screen viewing capability insures all critical blind spots can be monitored simultaneously. 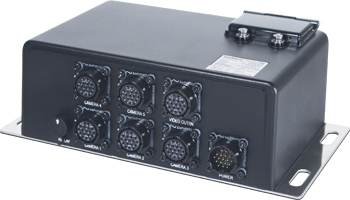 The multiple, programmable video and audio outputs allow you to record critical information or display it on additional screens, while the integrated active radar component adds an extra margin of safety.